RS6-42 GEN 2 TELEHANDLER . ENCLOSED CAB WITH HEAT. TWO JOYSTICK CONTROL. HIGH BACK SEAT. HALOGEN LIGHT PACKAGE. FOAM FILLED 13X24/12 TIRES. AMBER STROBE LIGHT. FENDERS. LEFT HAND MIRROR. 66" FRAMERS CARRIAGE D-TACH. 2"X4"X42" FORK SET 8400 LB RATING. The model RS6-42 GEN:2 is built with high quality components, which enhance performance on all levels. * Boom tip lift hook option is now available as a factory-installed option or field installed option. * Proven welded box-section boom design makes the boom stronger than competitive models. * Well-thought-out cylinder design provides one of the fastest cycle times in the industry. * Strong frame with reinforced C-channels performs well under heavy lifting conditions. * Frame leveling feature adjusts 10-degrees to the left and right, enhancing performance on uneven terrain. * Internal wet disc brakes provide excellent stopping ability and long life. * Dual-element air filter protects the engine from airborne contaminants, increasing engine performance and longevity. The RS6-42 GEN:2 Telescopic Handler features spacious, modern operator stations to maximize comfort and productivity. * 44 cubic-foot cab enclosure provides optimal leg room and a spacious operating environment. * ROPS/FOPS canopy is standard equipment; ROPS/FOPS enclosed cab is optional. * FOPS is completely welded into the ROPS, providing better visibility when placing a load. * Virtually 360-degree visibility increases safety and operating accuracy. * Deluxe high-back seat maximizes operator comfort. Adjustable suspension seat is optional. * Side and rear glass is standard equipment, enhancing operator safety. Safety and efficiency are two of the most important factors on the jobsite. The RS6-42 GEN:2 provides the tools to achieve both effectively. * Three steering modes – 4-wheel, 2-wheel and crab – enhance maneuverability and are easily changed by the flip of a switch. * SAHR (spring-applied, hydraulic-release) parking brake is applied automatically when the engine is shut off, or by pressing a rocker switch. * Remote Boom Control can raise/lower and extend/retract the boom, as well as start/stop the engine from the work platform or outside the cab. * Personnel Work Platform System allows the use of ANSI/ITSDF B56.6-compliant personnel work platforms for safety and efficiency. 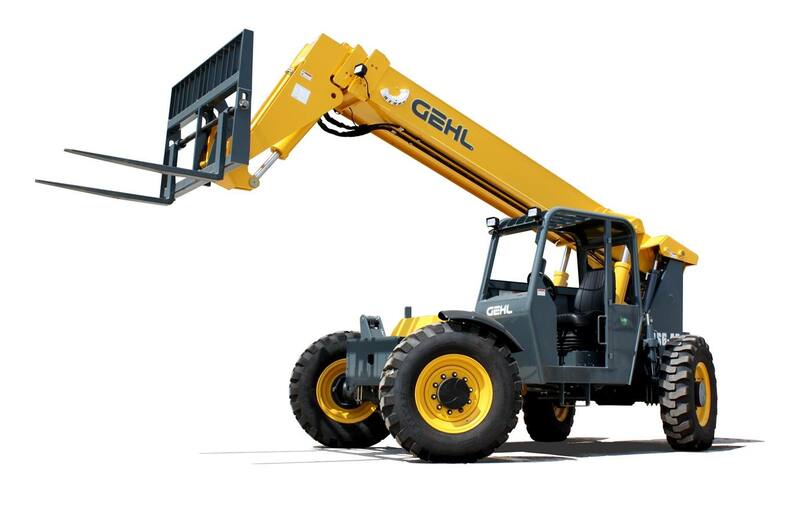 The RS6-42 GEN:2 Telescopic Handlers provides the power to get work done effectively and efficiently. * Dana three-speed power-shift transmission is easy to maintain. * Limited-slip differential in the front axle provides additional traction in muddy and unimproved surfaces. The model RS6-42 GEN:2 makes no exceptions when it comes to hydraulic performance. These machines can take virtually anything. * Dual-function, pilot-assisted joystick is standard equipment. * Optional tri-function, pilot-assisted joystick allows the operator to set variable tilt and auxiliary function speeds. * Auto-leveling feature keeps loads level when raising/lowering the boom. There is a tool for every job, and the RS6-42 GEN:2 can power them all. Dynattach® Quick-Attach system allows quick attachment changes with unsurpassed ease. B Rotating Carriage – 48" (1219 mm) and 66" (1676 mm) wide. D Personnel Work Platforms - 180° swing platform and 48" x 50" x 114" (1219 mm x 1270 mm x 2895 mm) platform. * This factory-installed option provides a secure lifting point for transporting suspended loads without the use of an additional attachment. * The lift capacity remains the same as a standard carriage, while the quick attachment point increases versatility and reduces downtime. Plenty of access points and over-sized covers make service and maintenance on the RS6-42 GEN:2 a snap. * Over-sized front cover provides easy access to the hydraulic reservoir and hydraulic pressure ports for service and testing. * Side-mounted fuel tank with battery access and an additional storage compartment. * Lockable rear-side covers located on both sides of the machine slide out of the way to expose the engine for service. * Shorter hoses from main valve to boom provide neat hose routing, enhancing serviceability. Capacity at Maximum Lift Height: 6,600 lbs. Capacity at Maximum Forward Reach: 1,000 lbs. Maximum Reach Below Grade: 14"
Length - Less Forks: 19'1"